Kochava Shriki, 44, told her sister she was pregnant for the first time as she boarded the flight to Burgas. Kochava Shriki, 44, who was murdered by terrorists in Burgas, Bulgaria, was laid to rest in Rishon LeTzion Cemetery early Friday afternoon. A short while before she boarded the flight to Burgas, Kochava told her sister that she was pregnant for the first time in her life. "Your death leaves a huge void in us," her sister said at the funeral. "I remember that you called me to tell me about the baby you are carrying in your womb. You were so happy then." Kochava's husband, Itzik Shriki, was wounded in the terror attack, and required medical attention during the funeral. Immediately after the terror attack he spoke to news reporters and said that he is looking for his wife. Weeping, Kochava's sisters told Itzik at the funeral: "It is not your fault, you risked your life to save her. We love you and will always be with you." 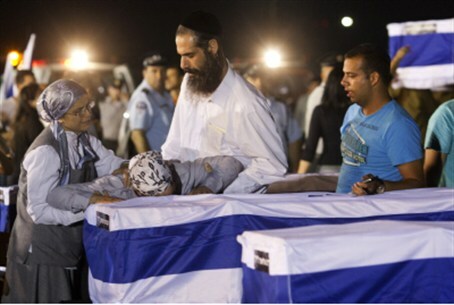 All five Israelis killed in the terror attack were to be laid to rest Friday. Maor Makhluf Harush was laid to rest at the Nahalat Asher Cemetery. His father, Benny, asked the comforters to pray for his son's wounded friend. "The flower of my life has gone," the father said. "He helped me in everyday life. Pray for Daniel to be strong. They are three brothers," he said, apparently referring to Maor and his friend Elior Preis, who was also killed in the massacre, and Daniel Fahima, who is wounded. Elior's funeral was scheduled for 4:00 p.m. Friday. Two other close friends killed in the terror blast, Amir Menashe and Yitzchak Kolangi, were buried in Petach Tikva's Segula cemetery. Menashe's widow, Natali, reached the cemetery in a wheelchair. "I saw pictures of Amir in the newspaper, it doesn't make sense," she cried out. "I have no one now. We spoke about our plans for the future, and suddenly we exploded. I saw him burn in front of my eyes. Next month he was supposed to have a birthday. I don’t want to live anymore."